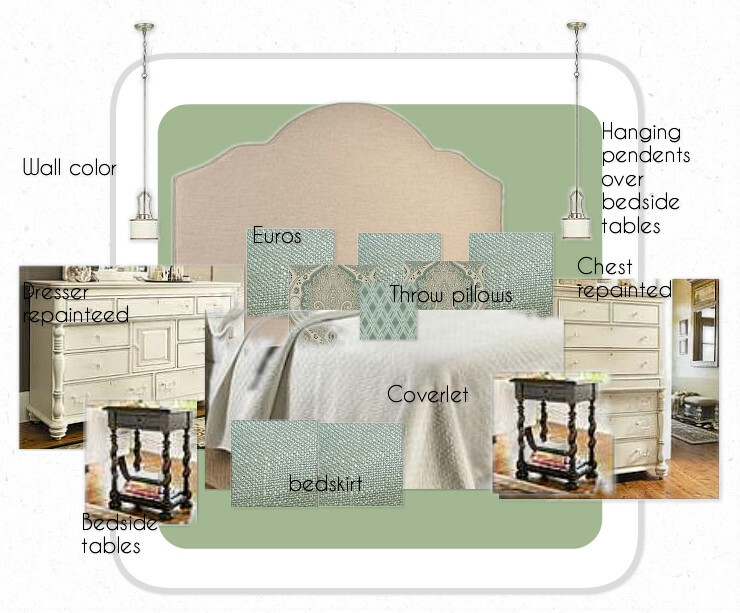 I am now working on my master bedroom. I want it to be ageless, comfortable and updated. The furniture I have was purchased in 1990. It is a king size rice bedroom suite. It was the IN thing back then but so outdated now. The pieces are well made and I am trying to reuse and redo what I can. Here are pictures of my bedroom now. You can see the door to the hall has already been painted black and I plan to paint the others in this room as well. The bedroom now looks great but I just want to update it. Anyone who has been to my house may remember the fireplace in the original brick which is the same as on the outside of my home. Last year I painted the brick white and the transformation is amazing. Sometimes little things like this can make a big impact on your home. Here is my design board. The headboard is already here. I purchased it at Kirklands for $249 and I had a coupon that reduced the price enough to cover the shipping and taxes. The bedside tables are Paula Deen. I first found these on Joss and Main for $199 (regularly $359) but they wanted $110 for shipping. I found them at a local furniture store Turners Fine Furniture for $199. Yeah me! Any money saved is more I can spend in other places. The fabric is here. Purchased from www.buyfabric.com with a great discount. I have already sewn the pillows and the bedskirt will be done this weekend. The coverlet purchased on Joss and Main is beautiful. 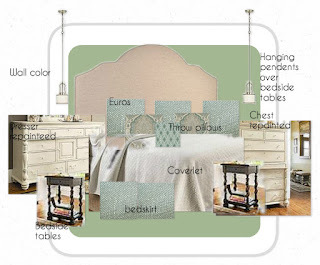 The chest and dresser are from the Paula Deen collection but I plan to use mine and paint them to look like these. This is a major savings! I just loved the look and actually saw them at Turners Furniture while I was there. It is called Linen but it is really an off white with taupe under tones. I painted the walls this past weekend and it is looking refreshed. I will not post anymore pictures until it is completed. Maybe another 2-3 weeks. Progress is slow when I am doing the work myself instead of hiring it out. Since I have major OCD, I would only drive anyone hired crazy. I am getting new carpet and I plan to add an area rug but I am having a hard time making any decision on that. I think when things start coming together, the decision for an area rug will come to me. Right now all the rugs are looking alike and nothing is really jumping out at me. In the mean time, I will post other projects I have done lately. Your link to BuyFabric doesn't work because I think it's missing an 's'. So, if you can change it to www.buyfabrics.com it will work. Love your blog!